The UNCG Women’s and Gender Studies Program invites you to submit a proposal for a paper, panel, workshop, or creative piece that explores systems of oppression and methods for responding to oppression, including with respect to race, sexuality, gender, class, ability, species, etc., and the relations among these categories. Proposals might address how these systems of oppression operate in spaces such as education, the university, the prison industrial complex, the animal industrial complex, the news media, social media, the mental health industry, the non-profit/NGO complex, the political sphere, and more. Submissions from all academic disciplines are welcome. To submit an individual paper, please send a title and an abstract of around 200 words. For a roundtable or panel, please submit a title and abstract of around 200 words and the names of all the presenters (and paper titles if it’s a panel). The deadline for submissions is February 15th. The symposium is free, and there are no registration fees. 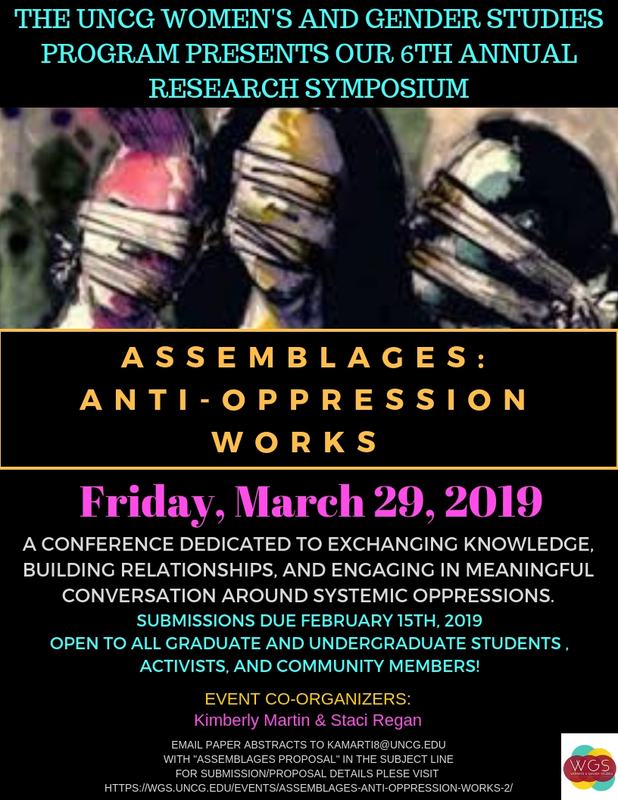 We hope to provide a space for students, faculty, alumni, community members, and others to come together to exchange knowledge, build relationships, and engage in meaningful conversations around systemic oppressions in a non-competitive and supportive environment. Proposals and attendance are welcome regardless of discipline, university affiliation (or the absence of one), and profession.